It’s a Saturday morning in April, and while it’s a beautiful sunny day here in northern Michigan. It is still early spring so it’s still not quite beach weather yet. If it were, I might grab a coffee and a book and head down to the bay for a little while. Instead, there’s an indoor farmer’s market at the commons that I have decided to check out. If you’re not familiar with the commons, it is the area of town that was historically the grounds of the Traverse City State Hospital. 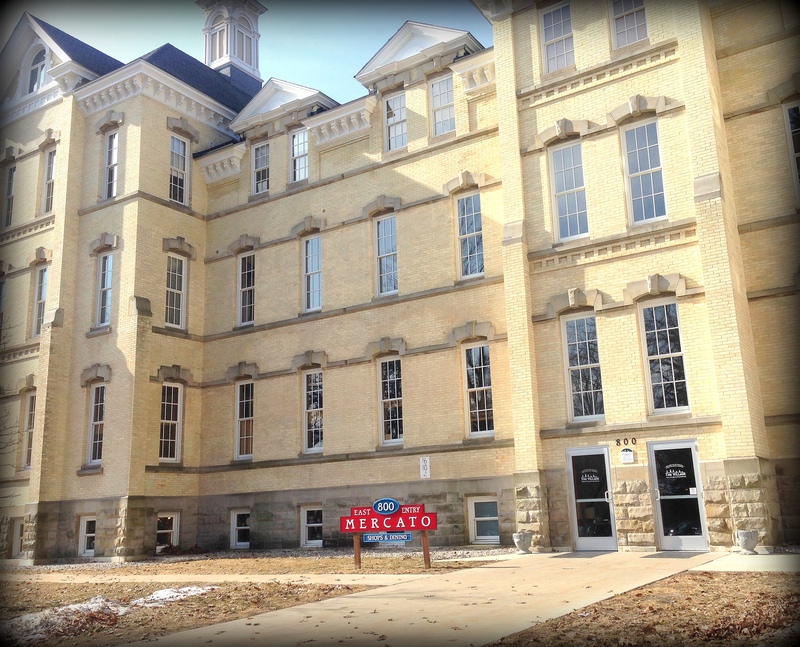 You may hear it referred to as The Mercado, The Old State Hospital, Building 50, or more formally as The Village at Grand Traverse Commons. I’ve heard it referred to most (by locals) as The Commons. When you’re driving north into Traverse City on US Route 31, (when you are near Meijers grocery store) if you look up you’ll see the red spires peeking out over the fields and above the treeline. Today,the tall pointed peaks stand out against the bright blue sky pointing the way. To get there, continue past the intersection at Fourteenth Street and turn left onto W. Eleventh street. Just past the State of Michigan Offices, go straight through the four way stop and up toward The Commons. You can go straight up to Building 50 and park around the circle drive, or you can turn left and go around back. I parked in the front and entered through this door to the center of the Mercado. Around the back, you’ll find more parking as well as some other businesses that have established themselves in what appear to be the restored out-buildings from when the original hospital flourished. There are two entrances to the Mercado from here, one at each end, and these are more difficult to see especially if you don’t know where you’re going. The key is to look for the red signs. They are painted the same red color as the spires. The Mercado is an indoor marketplace that now inhabits the restored lower level of the main building. Partly underground, with it’s pale yellow brick walls, it feels a little bit like a secret underground tunnel. But the sun shines in brightly through the windows and creates an ambiance that is warm and refreshing at the same time.